The Brickcom N series uses the Sony Exmor chip technology to produce the sort of night time images we can see above. In addition the N series comes in many different forms, from mini domes to bullet cameras. Below we list the full line up. FB-130N Fixed Box, FD-130N Fixed Dome, VD-130N Vandal Dome, OB-130N Outdoor Bullet FB-300N Fixed Box, FD-302N Fixed Dome, VD-302N Vandal Dome, MD-300N Mini dome, OB-300N Outdoor Bullet and OB-302N Outdoor Bullet. The 130 range are 1.3 mega pixel with 300 range giving 3 mega pixel definition. 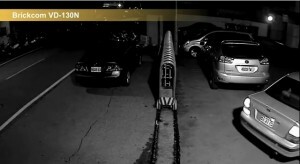 This entry was posted on Wednesday, March 7th, 2012 at 21:39	and is filed under IP cameras. You can follow any responses to this entry through the RSS 2.0 feed. Both comments and pings are currently closed.